In the late summer of 1860, Professor Giuseppe Ragazzoni (1824-1898), a prominent geologist from the Istituto Techniche di Brescia (Brescia Technical Institute), was collecting fossil shells from Pliocene deposits at the base of a low hill called Colle di Vento at Castenedolo, about 10 km south-east of Brescia. 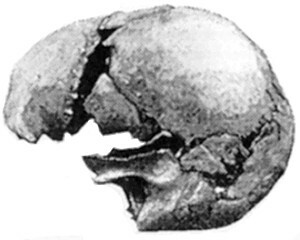 There, he found an anatomically modern human skull, supposedly in a formation dating from the Astian stage of the Middle Pliocene, about three to four million years old. It had coral cemented onto it with blue clay. Nearby, he found bones belonging to the thorax and limbs. Like so many of these nineteenth-century discoveries, the exact circumstances of the find are unclear; the most likely explanation is that the skull belonged to a relatively recent (and probably post-glacial) burial cut through this deposit. The archaeological applications of stratigraphy were not understood at this time, so a geologist working on Pliocene deposits would naturally assume that all bones and fossils from this stratum were contemporary with its formation. Although the anatomist Giuseppe Sergi (1841-1936) visited the site in 1883 and was unable to identify a grave cut, a skeleton was found at the site in 1889, when Sergi was able to confirm that it did indeed lie in a grave. A radiocarbon date obtained on the ribs in 1969 confirmed the recent date of the skull, with a determination of 958±116 bp (847-1271 Cal AD; BM-496); the presence of a second skeleton in a grave makes it likely that Ragazzoni had unknowingly stumbled upon a forgotten medieval cemetery. It had coral cemented onto it with blue clay. How do you explain this if it was a modern burial site? The grave was dug through the blue clay layer and backfilled with the same material; that is what was adhering to the skull. It has no bearing on the age of the burial. The site was medieval, as the radiocarbon date quite clearly demonstrates. That’s a silly assertion. Stratigraphy was understood at this time; the concept was described and understood back in the early 1800’s (by men like William Smith, James Hutton, Charles Lyell). In fact, it was widely understood – especial by geologists, and Giuseppe Ragazzoni was a professor of ‘geology’. He was not some country bumpkins with a pickax. The guy was educated and kept up with current scientific events. You make it sound like any discovery before 1900 is automatically suspect because the scientists where so stupid they did not know that older things are buried deeper, or that when people dig a hole and bury something, they are putting it in an older strata…. a concept a 4 year old understands. You act like they just put artifacts in a box without labels and jumbled them around back then. – these guys had brains as big as yours, they where not morons. If the dating studies are accurate, be it BCE, BC, AD, or BP. It has little chance of being anything but homo sapiens sapiens (sorry, no italics.) But nineteenth century science combined with radio carbon dating (IMHO) makes it just another dead human. No mystery. However Svante Paabo at the Max Planck Institute might appreciate the DNA for his growing collection. All it takes are a few more sequencers, clean rooms times two or three, and trained student volunteers.